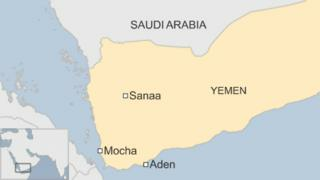 At least 38 people are reported to have been killed in an air strike on a wedding party in south-western Yemen. Medics said women and children were among those who died in Wahijah, a village near the Red Sea port of Mocha. The Saudi-led coalition, which began an air campaign in March to defeat the Houthi rebel movement, denied it was responsible for the attack. However, witnesses said warplanes targeted the celebration and Yemeni officials acknowledged a "mistake". The UN says almost 4,900 people have been killed in the past six month, including 2,200 civilians. A resident of Wahijah told the Reuters news agency that two tents where a wedding for a local man affiliated with the Houthis was being celebrated were targeted in the air strike. Many of the victims were women and children, the resident added. Yemeni security sources told the Associated Press that the coalition had targeted the wedding, and the agency quoted a senior government official as saying the strike was "a mistake". "This is a new crime that is added to the massacres committed by the Saudi regime against the people of Yemen," said the rebel-controlled Saba news agency. However, the coalition subsequently denied being behind the attack. Spokesman Brig-Gen Ahmed al-Asiri told Reuters: "There have been no air operations by the coalition in that area for three days. This is totally false news." Coalition warplanes have previously bombed non-military sites, killing dozens of civilians. An attack on a bottled-water factory in northern Hajja province in August killed 17 civilians and 14 rebels. The previous month, an air strike near a power plant in Mocha reportedly killed 65 civilians. Wahijah is located in Taiz province, where militiamen loyal to the internationally recognised government of President Abdrabbuh Mansour Hadi have been battling Houthi rebels and allied army units loyal to ousted former President Ali Abdullah Saleh. Earlier this week, Medecins Sans Frontieres said only seven of Taiz's 21 hospitals were still open. They were "totally overwhelmed" by casualties and have run out of essential medication, it warned.